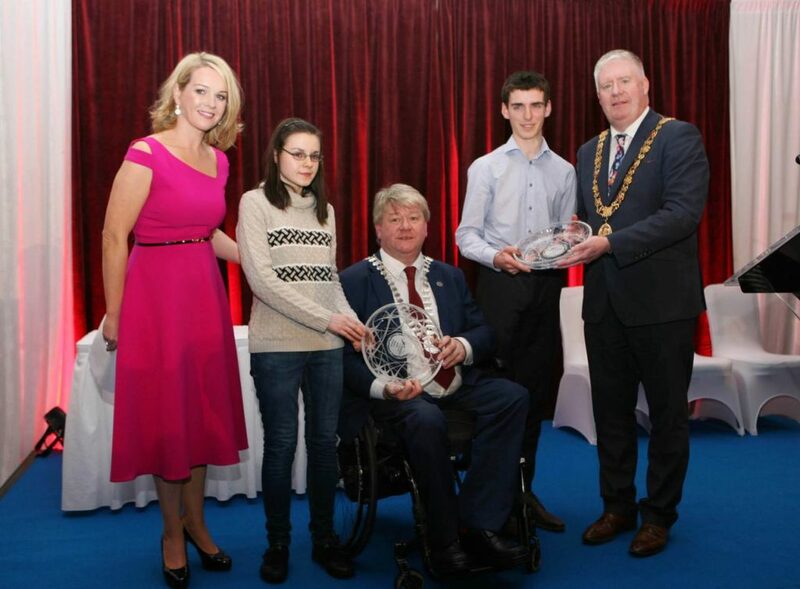 Award winning science students Eilíse Ireland and Simon Meehan have been crowned Cork Persons of the Year for 2018. Eilíse Ireland, a Regina Mundi School student, Douglas, Cork City and Simon Meehan from Ballinora, Co. Cork and a Colaiste Choilm student, Ballincollig, received a standing ovation from the 300 guests at the invitation-only Cork Person of the Year annual Gala Awards Lunch at Rochestown Park Hotel. Simon is the BT Young Scientist of the Year 2018 winner, and Eilíse was a winner at the Spellman Clean Tech competition in New York last July. County Mayor Cllr Patrick Gerard Murphy and City Lord Mayor Cllr Mick Finn presented the Cork Persons of Year trophies to the winning students, which was seen as a great vote of confidence for the youth of Cork. Simon Meehan was responsible for the discovery of a potential new antibiotic capable of beating antimicrobial resistant bacteria including MRSA. Eilíse Ireland beat some 550 teams from 40 countries to take one of the international prizes for her project to generate energy from rainwater in downspouts, producing a prototype water turbine using recycled computer parts and plastic bottle tops. Eilíse is daughter of Consultant Surgeon Adrian Ireland and Ellen Ireland and Simon is son of Dr Brigid Lucey and Jeremy Meehan. The Persons of the Year were chosen from 12 Persons of the Month selected over 2018. They were classical pianist, Kevin Jansson; sexual violence centre founder, Mary Crilly; legendary GAA figure, Dr Con Murphy; Butter Exchange Band leader, Herbie Hendrick; medicinal cannabis campaigner, Vera Twomey; arts and cultural promoters, Conal Creedon and Liam Ronayne; leading champion jockey, Davy Russell; author and columnist, Louise O’Neill; sound and performance artist, Danny McCarthy; world champion rower, Sanita Puspure; and Liam Miller fundraising committee chairman, Michael O’Flynn. 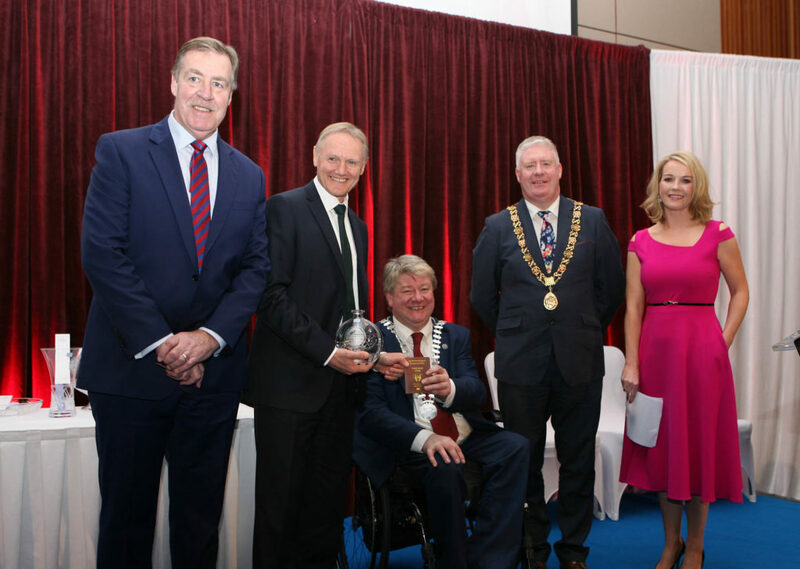 Other outstanding Corkonians presented with awards included journalist Fergal Keane, winner of the Hall of Fame award, and Joe Schmidt, Irish Rugby Head Coach who was officially dubbed an honorary Corkman. A special award was also presented to the RTÉ Nationwide team, producer Eoin Ryan and presenters Mary Kennedy and Anne Cassin, to mark their 25th anniversary. RTÉ’s Claire Byrne was MC of the event, which was attended by representatives of all sectors of Cork society, including senior public representatives Tánaiste and Minister for Foreign Affairs and Trade, Simon Coveney TD and Leader of Fianna Fáil, Micheál Martin TD. Hall of Fame recipient Fergal Keane, who holds an OBE for his services to journalism, is a Special Correspondent with BBC and a well-known international correspondent, regarded for his coverage of war zones around the world. His coverage of the Rwanda genocide earned him Amnesty International’s highest honours. Speaking on his achievement, Cork Person of the Year founder Manus O’Callaghan said “In the year Time Magazine’s own Person of the Year was the “War on Truth”, where journalists who were killed, persecuted and jailed over the last year were honoured, it is fitting that we should honour our own distinguished and brave Fergal Keane too.” Fergal Keane is son of acclaimed actor, the late Eamonn Keane and nephew of playwright John B. Keane. He was accompanied to the awards with members of his family including his mother Maura O’Shea. Lord Mayor Cllr Mick Finn with Hall of Fame Award Winner Fergal Keane OBE. Picture, Tony O’Connell Photography. 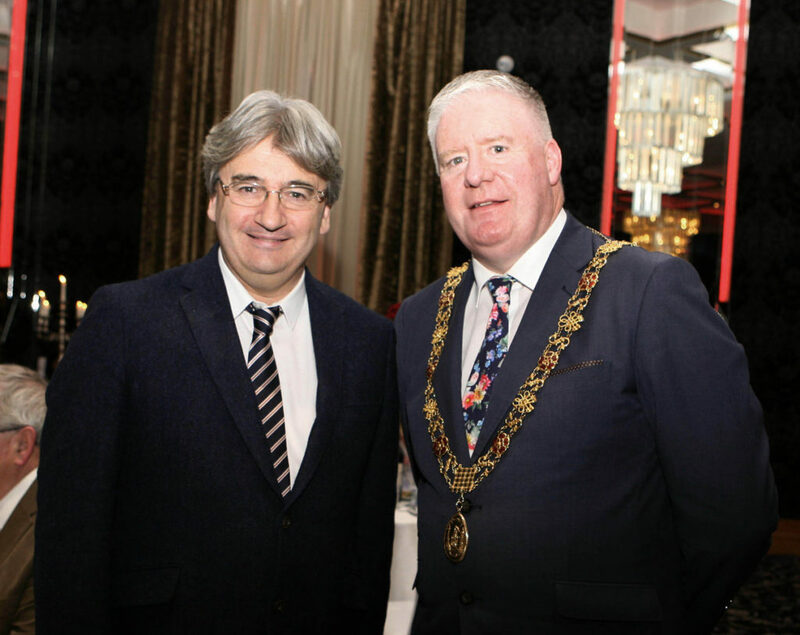 The Gala Awards Lunch marked the 26th year of Cork’s premier award scheme. Speakers included Irish Examiner Managing Director, Ronan McManamy and RTÉ’s Director General, Dee Forbes. On behalf of the award scheme organisers Ann-Marie O’Sullivan of AM O’Sullivan PR thanked the sponsors and award judges, Tim Lucey, Chief Executive of Cork County, and Ann Doherty, Chief Executive of Cork City. Sponsors were the Irish Examiner, RTÉ, Southern, Lexus Cork, AM O’Sullivan PR, Cork Crystal, Tony O’Connell Photography, AV3Media, Musgrave Market Place, CAVS and Robert Stephens Display.